This is what you get after one winter when a Florida starchitect is hired to design a building in a midwestern climate. I've seen that, too, Mike. Wondered what exactly had happened and your short description actually says a lot. 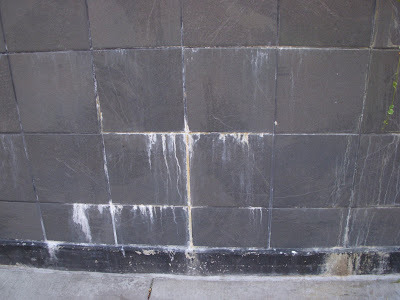 I'm pretty sure that the white streaking is technically called efflourescence, which is caused by moisture seeping out and leaching the minerals in the mortar. I'm not exactly sure what went wrong, but most likely the architect did not detail the joints properly for this climate. This is the Gateway Building, right? If so...I have to agree that the architect totally screwed the pooch on this project. Totally out of place and does not even add a modern/contemporary compliment to the area. It's just out of place. Modern architecture can be done right, but this sure wasn't it. Yes, it is the Gateway I.